On the occasion of the International Freshwater Dolphin Day, WWF-Cambodia and the Fisheries Administration organised a massive celebration in Kratie province. 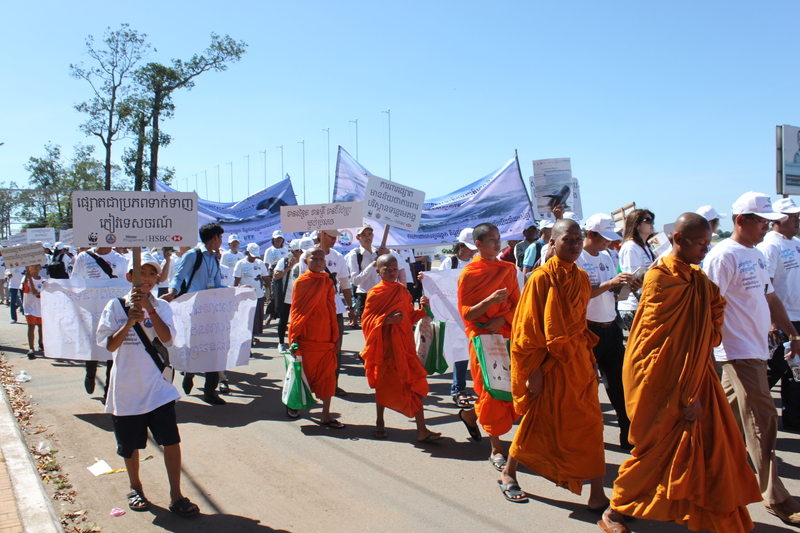 More than 400 participants joined the event to show their support for the protection of the critically endangered Irrawaddy Dolphin and to protest against the Don Sahong Dam, a dangerous project that could eradicate this iconic species from Cambodia. 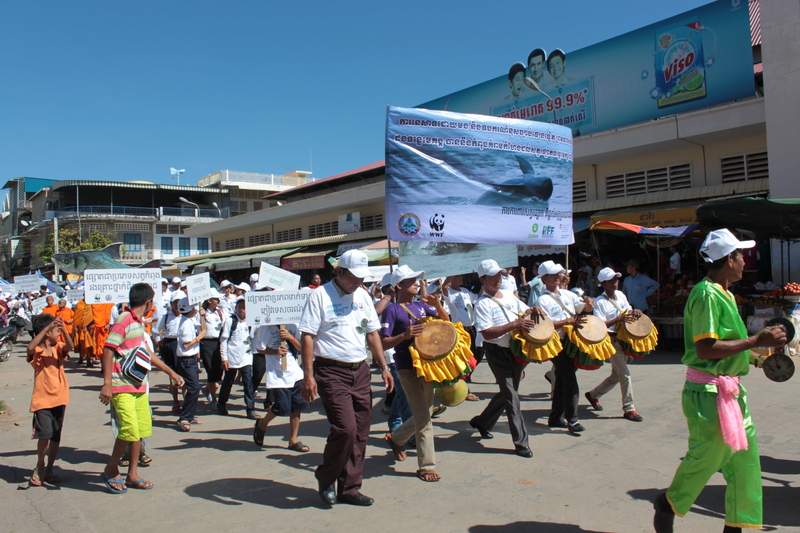 The Freshwater Dolphin Day celebration organised in Kratie gathered more than 400 participants including students, teachers, monks, local communities, river guards, delegates and representatives of provincial and national Fisheries Administration, local authorities, private companies, and other civil society organizations. All guests came together to highlight the importance of protecting the last Mekong Irrawaddy Dolphins. To bring their message forward, participants joined in a parade that marched through the city, holding sign boards and sharing their desire to preserve this species for future generations. This was also the occasion for them to show their opposition to the Don Sahong Dam, a disastrous hydropower project that could impact the last Mekong Irrawaddy dolphins and the food security of the millions of people depending on the river's fisheries. As part of the event, WWF-Cambodia released the results of the latest Mekong Irrawaddy dolphin population survey. This survey shows that its new population is 80 individuals, which is still five less than in 2010 but, most importantly, their annual rate of decline has slowed. “The result of the survey gives us a clear number of the endangered Mekong Irrawaddy Dolphin, which is considered our country’s living national treasure, and it reflects our many years of continuous efforts put into protecting this species, ” said His Excellency Eng Cheasan, Director General of Fisheries Administration of the Ministry of Agriculture, Forestry and Fisheries. The event and the related press release on the new Mekong Irrawaddy Dolphin population survey were covered by popular national and international media, thus raising public support. This event is a key part of WWF-Cambodia’s actions to raise awareness on the importance of the Irrawaddy dolphin and to bring the dangers of the Don Sahong Dam project to the attention of the general public.